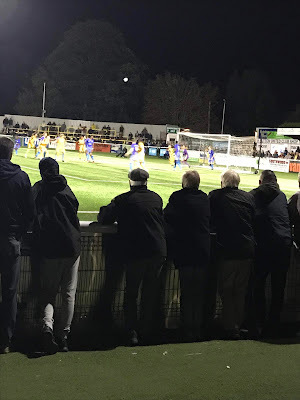 Now it is time for what we would call 'a bogey side' – Dover Athletic, and for me personally this is a club and area that I am not fond of. Thankfully, part of that is resolved as I no longer have to go down to said area for work purposes anymore. So fond of this place was I, that each time I did go there my colleague and I upon arrival always used to say to one another “what time is our train going back?”. I would hazard a guess though that once upon a time that Dover was not only a nice place to visit but to live. Naturally, this team are also part of Robbo’s list of teams I do not like which, as Southampton Steve asks “Is there any team that you do like?” the answer to this categorically is no! Well, apart from Sutton of course! Upon entering the stadium I notice on the other side to the queue is one of my work’s directors – she is a home and away follower of Woking but has decided to pop along and watch Sutton tonight, let’s hope she is not too disappointed! We have an average record in these midweek meetings at home with teams in the bottom four. 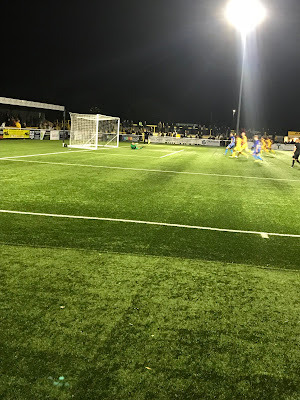 The first 20 mins are all Sutton and the lads go 2-0 up in that time, the first goal coming inside the first two minutes where a Tommy Wright run with the ball is squared to Easty whose first shot was initially shot was saved only for the rebound to be tapped in. Then a 17th minute corner was headed in by Nicky Bailey and all of us on The Shoebox were wondering how many more it could be. 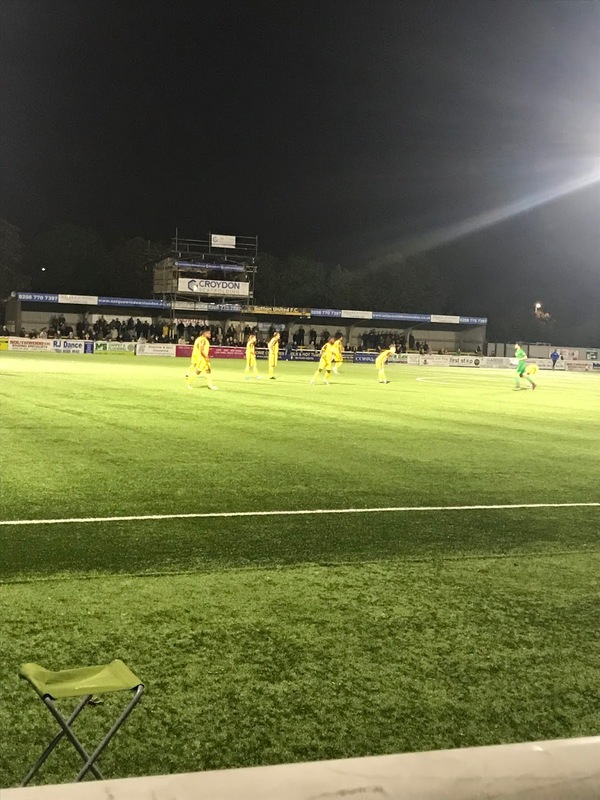 That is unless you were looking at the scoreboard which appeared to be stuck on 1-0 and did not acknowledge the second Sutton goal until a few minutes later! Conversations then turn to a more disgusting nature where Mr X mentions that he left a dump in a directors only toilet at work and did not flush it. I for one know all about Mr X and his toilet matters as it took me four flushes to rid of what he left in a toilet the night before on a trip up North once. He's almost as bad at that Welsh bloke! 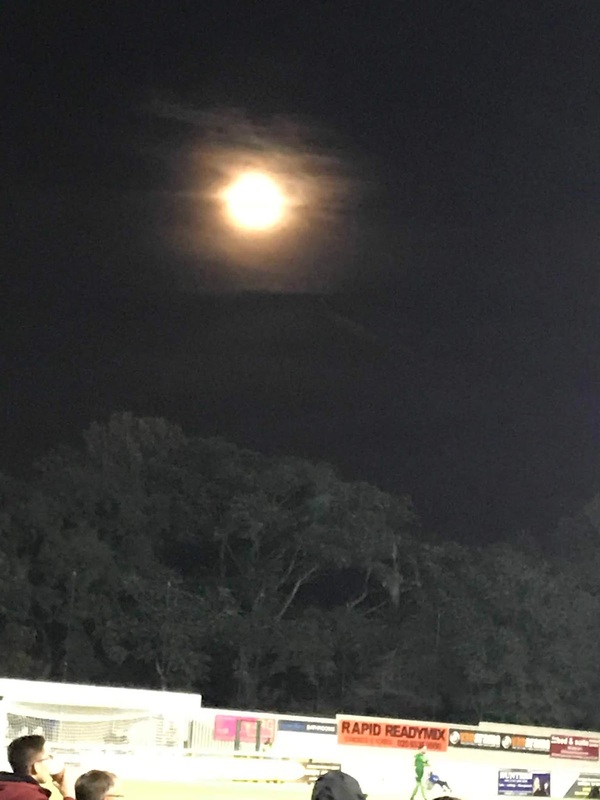 We also wonder as to the ludicrous manner that the game has been segregated and Southampton Steve estimates around 55 Dover fans are present – the correct attendance to come later on. Popworld is another subject matter raised and Jane and Natalie talk about a Popworld opening up in Hartlepool, which I can confirm according to the Popworld website one is indeed opening in the North Eastern town, but no specific date is given. Thanks to Natalie for assisting with the title by the way, as with sounds and smells emanating from The Shoebox during the first half, we wonder what on earth has been eaten for such things to occur. Ok, yes I am on blog duty, but why break the habit of a lifetime? And just around the half hour mark HTS and I start to make tracks round to the bar. As we do so, JC goes off with a knock and is replaced by Dean Beckwith, then further disaster strikes when on 36 minutes Dover are given a penalty for handball – their first even remotely vague sight of goal so far – and it's converted to make it 2-1 before half time. This news of a goal sort of dampens the half time mood but I chat to HTS by declaring that Home and Away is the best soap on TV – mainly because of a one Tori Morgan, she’s a star! Upon heading out for the second half, I am stopped by someone I have not seen for a while and thus engage in further networking and stakeholder engagement – its Civil Service talk. Sorry. But as the second half develops it makes me wise I had not bothered to emerge yet. What turns from a magical opening 20 minutes in the first half to something totally dreadful in the second half. 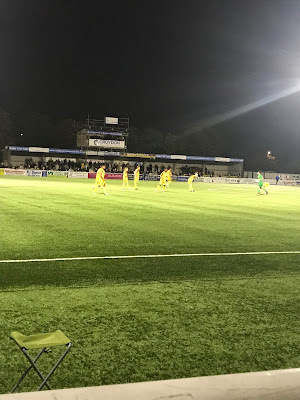 It seems the tactic now is to lower ourselves to Dover's level and just lump the ball up and hope for the best – that is unless you come up against the giants of the Dover defence. As the game draws on and on, you get the impression something disastrous is on the horizon – like an equaliser. 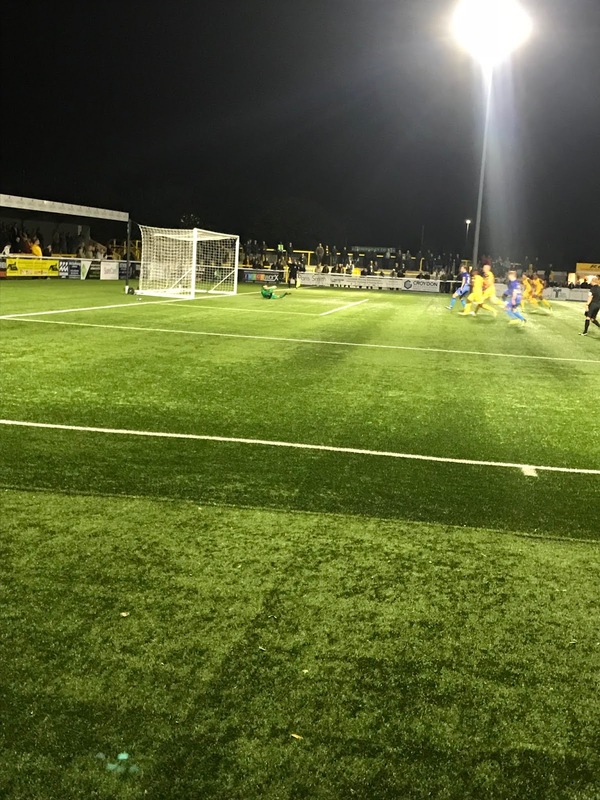 With nine minutes to go, Sutton were given a bit of a lifeline when a Dover player is sent off for a challenge on Nicky Bailey. Now, you would think job done but no, this is us, so with three minutes left to go a Dover corner is sent in and a header is inevitably bundled in for their equaliser, just like last year. Gutting! What is left now of the time to go and a further four minutes of injury time leads to nothing and two points dropped against a terrible Dover side. An attendance of 1694 were in attendance of which 47 were from Dover. So much for Steve's 55! The bar afterwards is quite a sombre one but the patrons are somewhat uplifted by watching Derby County beat Manchester United on penalties in the League Cup. As Dukey and Greek leave I mention to Dukey that not only will yours truly not be at Dublin but also not at Leyton Orient this weekend, which leads to him saying a double F you to me. Charming. Hey a Greenshaw High School reunion is not an opportunity to be turned down! With a result like this we also get the usual people on social media telling us how we have let them down with their accumulators and thus us being “coupon busters”. Hey as that advert says chaps “when the fun stops, stop”!! If you don't want to lose, don't bet. As mentioned, I will sadly not be at Orient on Saturday but I for one know it will be a tough game and a win or even a draw would be a bonus. Good luck all!